A public squabble between a local activist and a Chattanooga police officer in Tennessee has sparked an internal affairs investigation and raised concerns among officers about their right to privacy. The incident started a week ago Thursday when Officer William Puckett and local activist Chris Brooks commented on a Facebook post about racial injustice. Puckett, who has been on the police force since 2002, made two comments that suggested Brooks shouldn’t discuss racial injustice because he has never been a police officer. In the days since, Police Chief Fred Fletcher started an internal affairs investigation into whether Puckett violated the Chattanooga P.D.’s social media policy, a local resident filed a complaint against Puckett, and Brooks submitted an open records request for all of Puckett’s text messages from the past two years. 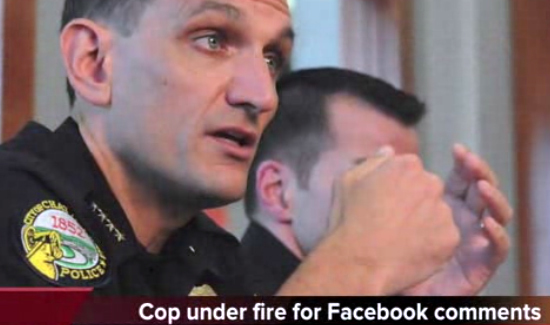 Do you think law enforcement officers should be restricted in terms of posting on social media? Leave your comment below. Why should they ( police officers) be held accountable when we refuse to hold our own elected Officals by what they say and do? do the rules not apply to them when our vice president is insulting china ? As a citizen and an individual speaking in a public forum there should be no limit on what an officer chooses to say when off duty. There is the concept of privileged conversation. Officers hear and are exposed to information that must be kept confidential as investigations continue. If they are aware of something that is not coming out at a trial they have a responsibility to speak…….to appropriate judicial authority. Likewise failure to report criminal activity is wrong. They must make it clear they are not speaking as a government representative. Exchanging insults may be a waste of time & energy. Professionals should be able to select their own battles. Laws of libel & slander apply. Nobody can claim a freedom from reprisals for workplace conversations that drift onto chat rooms. Yes, I believe we, as active duty and retired Officers, such as myself, need to bite our tongues on occasion. I don’t think we need to drag ourselves down to the same level as some of the Dirt Bags we have to deal with on a day to day basis. Yes, I said Dirt Bags. If the shoe fits, wear it. I am a strong believer of Public Relations, but I don’t like to get dumped on either. Do I talk with forked tongue, maybe, but what’s right is right. Remember, our job is 99% Boredom, and 1% Panic. Enjoy the Boredom, and thrive on the Panic. Once a Cop, try to forget about it off duty. Once a Marine, ALWAYS A MARINE. Oohrah and Semper FI. On duty, in uniform when acting a a Police Officer there are limitations as to what you can say. Off-duty, on a publicly available platform to which anyone can contribute the same rights of free-expression should apply. Say anything you like, be prepared to defend it, and take responsibility. Limiting what a person can say, regardless of their profession, when acting as a private citizen is censorship. That is much more dangerous then comments by an active duty law enforcement officer speaking as a private citizen.